Shakespeare in Love is a grand celebration of the creative drive and the pleasure of fiction. It's also what we consider a Perfect Film - much like Rashomon or Ladri di biciclette. Fictions layer over each other in Shakespeare in Love - and the way we approach this fundamental deceit is explored. Are we like the enraged, indignant preacher, waving his hat at the fact that "vice is in the show!"? 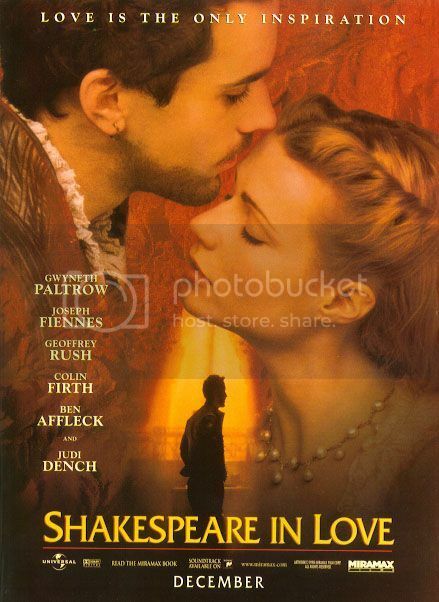 Or are we like the passionate theater-goer Viola de Lesseps (Gwyneth Paltrow), who admits that her love affair with William Shakespeare (Joseph Fiennes) "is not life - it is a stolen season", or, even better, is a "flattering dream - too sweet to be substantial", but revels in it nonetheless? Because fiction abounds - fiction as the transformative, cathartic, passionate release for our transcendental drive. The fiction of Viola as "Thomas Kent", an actor for the down-on-his-luck Henslowe (Geoffrey Rush) and his struggling theater company. The fiction that Shakespeare is writing Romeo and Ethel the Pirate's Daughter - no, Romeo and Rosalind - no, whatever - and that this play is for Henslowe… no, his competitor, Burbage (Martin Clunes). The fiction of Viola and Will's love for each other - she, already bound to the blunt, unimaginative Lord Wessex (Colin Firth); and he, exiled from his wife and children in Stratford. The fiction of the final play - Romeo and Juliet - and how it interweaves with the stolen romance Viola and Will enjoy. You could call it lies or deceit, but everyone is definitely living in a fantasy in this film - deception, masks, costumes and dissembling abounds. Yet - just like in the Neopolitan underworld and its circus-like, surreal atmosphere in Mi manda Picone - this essential non-reality is accepted by everyone. It's like structured play. Everyone agrees that this isn't real, and everyone still operates within these bounds of non-reality. Of course, the strength and intelligence of this film relies almost entirely on the strength and intelligence of the script by Tom Stoppard. The actors are all uniformly strong; it's a veritable tour of RADA talent. The music and direction support and give accent to what is essentially an emotional story (much as dreams have their own emotional logic!) and, of course, it's great as just a celebration of Shakespeare (expect lots of puns and references). It also does something which is rare, but delightful, to behold: it shows us the creative process at its most fluid and prolific. Like Amadeus, this film captures the verve and alive-ness of producing something creative, especially when that something just pours out of you. As if you were a conduit to something greater. The best part of being human? We'd wager Wessex his fifty pounds on it. You made me fall in love with this movie all over again! This film to me was a huge dissapointment. Everything in it felt fake and in your face. I loved the cast apart from the two leads - JF doesn't have any of his brother's good qualities in acting and Gwyneth Paltrow is... well I have no words for that performance. I certainly wished that I was able to channel on the vein that fed everyone else but as far as I'm concerned, this film was a total fail yaar. Now Amadeus, I really really loved. At least the lead performances were both excellent. Poor Eliza Bennett (a suspiciously metafictional name, methinks). JF in my books is an altogether better actor than RF (horrible even to contemplate him in this role), and brought a fetching nervous energy, and obvious intelligence, to the screen. Perfect casting. As for Gwyneth: well Hollywood stars with good English accents are fairly rare. I thought she did fine. Amadeus is the superior film, no doubt, but how can you fail with a soundtrack like that? @eliza I am with you 100%!! This film was a disappointment for me, too. Gwynnie's performance was subpar and her accent was worse. Paltrow does a good English accent, and she's an extremely passive actress anyway. Her strength lies in her delicacy. The film itself is a Stoppardian delight, full of in-jokes, word play and allusion. The more you know about the Elizabethan theatre, the better it is. In that sense it is perhaps best seen as a commercially successful art house movie, with enough straight laughs to keep the groundlings happy. I know that sounds horribly condescending, but how many in this movie's audience would have got John Webster jokes? I wouldn't cast RF in that role but he is the better actor (by far) in the family. Never seen him give a bad performance. JF's performance came off as too forced, too aware for my tastes (as the film was but the other actors -such as Mr.Rush- managed to make it work in a way JF couldn't) GP was like in another film and all I can remember of her is her hair. to Anonymous : Many of the references being too obvious and self congratulary was a big turn off for me. I felt like someone telling a joke (badly) and the only one who's laughing at it is him/herself. Having said all of the above, I really wanted to enjoy it (as I do with every film) but couldn't. And feel envious of the people who did. Oh! Who knew this movie would have such polarizing opinions. I can definitely see how the tone of the film might be seen as a bit self-congratulatory - I felt that way a bit about Stoppard's Rosencrantz and Guildenstern Are Dead, which I think people often use as a measure of their own cleverness. Eliza - do you like Stoppard's other stuff? And, for the record, the PPCC doesn't subscribe to the view that movie quality can be accurately proxied by popularity or Oscar wins. Those are, if anything, very imperfect measures of a particular demographic's tastes - nothing more! And by "have polarizing opinions", I mean "provoke" them. I referred not to quality but to popularity, a point germane because this is a "difficult" film and was, I believe, unexpectedly successful. "Eliza - do you like Stoppard's other stuff?" Enigma - I liked it. "Brazil" though he is a co writer in that one. Brazil is a terrific film. Very Stoppardian. He also wrote the screenplay for Empire of the Sun, Spielberg's excellent rendering of J.G.Ballard's autobiographical novel. Stoppard is known primarily as a playwright - perhaps Great Britain's foremost (along with Alan Ayckbourn). His plays are intellectually taxing but always enjoyable.